Director Christopher Nolan is an acclaimed film director that many, including myself, have found to be exceptional in the execution of the films that he directs. While he’s been around for quite some time, developing several short films (both released unreleased), several first noticed Nolan’s work as a director in his sophomore film Memento. Released in 2000, Nolan’s Memento was a complex film of dueling narratives story threads, which meet at the end of the film, producing one whole and cohesive narrative storyline. Even if you didn’t have Memento on your “movie radar”, many (and I do mean many) recognized Nolan’s directorial work after successful taking the DC superhero “cape crusader” (i.e. Batman) and created the celebrated Dark Knight trilogy (Batman Begins, The Dark Knight, and The Dark Knight Rises). From there, Nolan went on becoming a much-respected director from critics and the public of moviegoers, with his other films like The Prestige, Inception and Interstellar. Nolan’s approach to crafting a feature film is what makes him truly stand out, rooting his pictures with sociological, ethical, and philosophical concepts / ideas, the explanation and constructs of time, and the nature of personal identity and memory. Additionally, Nolan, who usually also writes the screenplay for most of his movies, also weaves very complex narratives, with some nonlinear storytelling and a tendency to emphasis characters (and their cinematic journey) rather than making the feature’s primary focus on its visual effects and other nuances. Now, director Christopher Nolan (and Warner Bros. Pictures) his newest film Dunkirk. Does Nolan masterful translate well into this WWII period piece or does something get lost within its historical backdrop? Set between May 26th, and June 4th, 1940, Allied soldiers fighting in WWII (both British and French armies) are sounded on all sides in Dunkirk, France by German Army Forces. With the enemy closing in on them, the soldiers (roughly 400,000 of them) are ordered to evacuate on the beaches, by way of an operation known as “Operation Dynamo”. On the ground, British Army privates Tommy (Fionn Whitehead) and Alex (Harry Styles) are among those desperately fighting to stay alive and get off the beach, by whatever means available to them. Elsewhere, across the sea, local mariners such as Mr. Dawson and his son Peter (Tom Glynn-Carney), and Peter’s friend George (Barry Keoghan) are recruited by the British Royal Navy to help with the Dunkirk evacuation. Meanwhile Royal Air Force pilots like Farrier (Tom Hardy) and Collins (Jack Lowden) do battle with the German bombers, in order to help the Allied soldiers in their evacuation efforts of leaving Dunkirk. With the narratives comprising of land, sea, and air, it ultimately becomes clear that time is of essence for everyone and, in the face of overwhelming odds, that the retreating from Dunkirk is far more dangerous than any ever expected it to be. As I stated above, Christopher Nolan has become a very successful and widely-known film director over the past several years in Hollywood moviemaking. Whenever he announces his newest film to direct, the internet newsfeeds light up as many moviegoers and critics eagerly start counting down the days to its release. I do remember first seeing Memento and, at first glance, found it to be confusing, but I learned to appreciate its complexity and unconventional narrative over time (I definitely had to watch that movie several times to fully get it). And of course, I, like many, fell in love with Nolan’s The Dark Knight trilogy, especially with The Dark Knight, and how Nolan’s take on the infamous DC comic book character changed the ultimate direction of superhero movies (for the better). Then came Nolan’s mind-bending feature of Inception and blew me away (probably one of my favorite Christopher Nolan movies) with its actors / characters of the movie (my first introduction to actor Tom Hardy) and within its intricate storytelling of individuals entering a person’s subconscious dreamscape. Nolan’s last film Interstellar, however, was a bit of tossup. Sure, it had all the flairs and nuances of Nolan’s works as well as being well-acted and delivering a very intriguing story, but it was way too drawn out and a bit confusing in trying to decipher all the scientific techno-babble for all non-master degree in quantum physics individuals. This, of course, brings me to this review for Christopher Nolan’s newest film Dunkirk. Like I said, when it was first announced, the entire internet was abuzz with anticipation of its release. Nolan has tackled complexed fictional storylines, superhero features, mind-bending films, and even braved the realm of outer space. However, Nolan has never tackled the world of non-fiction in his movies, which makes Dunkirk, a WWII period piece, his first feature film in that category. Naturally, hearing of the actors that were going to be in the movie (Hardy, Rylance, Murphy, etc.) made me excited to see the film as well as seeing the movie’s various trailers (some of them I saw many times in my weekly outings at my local movie theater). Suffice to say, the movie Dunkirk was definitely on my mind to see when it got released. So…. what did I think of it? Nolan’s newest film achieves greatness, finding Dunkirk to be his most nerve-racking thriller feature yet, while also producing a quality film that’s quite intriguing and explosive to watch. In short, if you were slightly disappointed with Interstellar, then Dunkirk is the remedy for that disappointment. Perhaps one of the most interesting things about the film Dunkirk is the movie’s actually story being told. Let’s be honest…. how many people (honestly) knew of either Operation Dynamo and / or the evacuation of Dunkirk (let alone where Dunkirk is actually located in France)? Recalling history classes from high school, mostly everyone knows about the major events that took place in Europe during WWII, including The Holocaust, D-Day, Operation Market Garden, The Battle of the Bulge, and “The Blitz” over London, but chances are that many didn’t know about the events that transpired between May 26th to June 4th, 1940 in Dunkirk France. This, of course, gives Nolan a fresh opportunity to inform us (the film’s viewers) of such events that happened during the evacuation of Dunkirk (albeit through a cinematic depiction). It’s also a bit of an unconventional WWII story to tell in as a film, for the actual tale of Dunkirk is not a decisive battle been fought or a promising victory to won. In truth, the story of Dunkirk (both in real-life and in the film) is about glorious retreat from an encroaching enemy and miracles that saved thousands of lives from certain doom. Just think about this, if the retreat from Dunkirk did actually fail, then the overall outcome of WWII (at least in Europe) might be different from what actually happened several years later. The written / spoken dialogue in Dunkirk is also quite an interesting element, which certain does set it apart from his previous work, let along any other WWII feature out there. What do I mean? Nolan takes a very minimalistic dialogue approach in the film, with much less talking and / or conversation between its various characters. It’s definitely a bold move to do, but this so-called “gamble” works within the context of the film greatly, finding the toned-down dialogue to be beneficial to the story at hand as the movie’s visuals (what’s happening on-screen) do majority of the Dunkirk’s talking instead. Thus, admits Dunkirk’s sound and fury of war, there’s a quietness to the feature, allowing us (the viewers) to absorb the sheer gravity of situation rather than characters telling us about it. In fact, while most Nolan’s characters in his other films focus on self-identity or face / pose philosophical meaning and understanding within their overarching development, Dunkirk takes a vastly different approach, with the director choosing to focus on the characters during their current situation (i.e. the evacuation of Dunkirk). There’s no flashback sequences of a time before the war or rousing and poetic speeches from a company commander, or solders sitting around and regaling to their fellow comrades of “tales from home” and / or what battle they fought in earlier. As I said, Dunkirk is about the actually exodus from the Dunkirk beaches and keeps the film’s perspective in the present / current situation, with thousands of young men, who are scared and are desperately trying to leave the beaches of Dunkirk, away from the approaching enemy, and to safety by any means unnecessary. Also, Dunkirk, which is only 107 minutes long (roughly the standard time for an animated feature or comedy fllm), moves at brisk pace and keeps the action / tense moments high for the feature, which helps engage its viewers into the picture. In addition (because I don’t know where to put this in my review), Nolan doesn’t really focus hard on the showcasing of the approaching enemy (aka the Nazi Germany forces). Yes, there present and are constantly causing trouble for the Allied soldiers, including the ones the movie follows, but Nolan never lingers on them like other WWII films do. So, don’t expect scowling Nazi commanders, or grim-faced German soldiers, or any Nazi party nuances (i.e. Swastikas or the ill-treatment of Jewish individuals). Again, Nolan keeps the focus on the current situation at hand. Just like with Memento, Inception, and Interstellar, Nolan has showcased the construct of time in both understanding it and utilizing it as a storytelling feature. Dunkirk is no different as Nolan uses the constructs of time to frame the picture of the excavation / rescue of the soldiers in Dunkirk. For the most part, narratives of WWII war movies usually follow a soldier or a company of men through their journey on the battlefield, but Dunkirk as several storylines (three to be exact) going on at the same time. Well, it’s not exactly the same time as the film follows the three narrative threads (on land, at sea, and in the air) with each one given a respective time (i.e. one week, one day, and one hour). Sounds confusing? It was at first, especially during the first act of the movie, but the narrative threads slowly start to come together as Dunkirk reaches its third act. It can be a bit jarring at first to see several scenes over again (albeit from a different point-of-views), but the splicing of these story threads is quite ingenious from Nolan’s directorial work, which makes Dunkirk that much more fascinating to see (and it ultimately connects to the events of the three stories). Adding to the unconventional way of storytelling, Dunkirk never goes into that category of being violent with blood ang guts. Unlike other WWII war movies like Saving Private Ryan or Hacksaw Ridge (both of which I love), which showcases the brutal violence and horrific carnage of war (i.e. 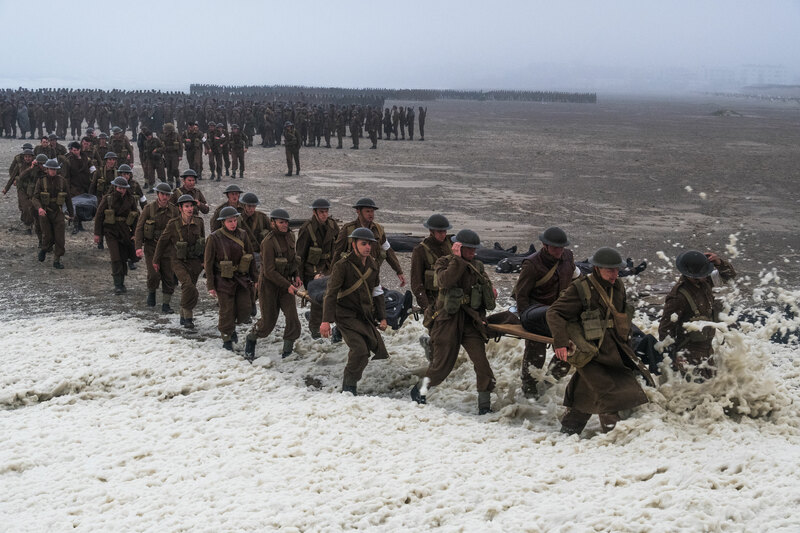 gory blood, severed limbs, and gruesome deaths), Nolan doesn’t fall prey to that stereotypical wartime depiction, but does present Dunkirk with the sheer amount of terror that all the young men (on all fronts) face with the mass exodus of Dunkirk. From onset to conclusion, Nolan keeps up the suspense up and at full throttle with plenty of nerve racking scenes and shows the amount of genuine fear that these individuals face without resorting to blood and guts. So, yes, despite the film being rated only PG-13, Dunkirk doesn’t shy away being one of the most nerve-racking films of the year. On a technical level, Dunkirk is truly amazing to see. Nolan’s past films have always been crafted extremely well and intricately detailed, with Dunkirk being the latest one in that respective category. In front of the camera, Nolan has always used more practical effects than CGI based ones, finding Dunkirk to be a marvel to look at, with its expansive beachhead and the various boats and seafaring vessels that are utilized in the feature, which carries the hefty cast (major, minor, and extras) throughout the feature. 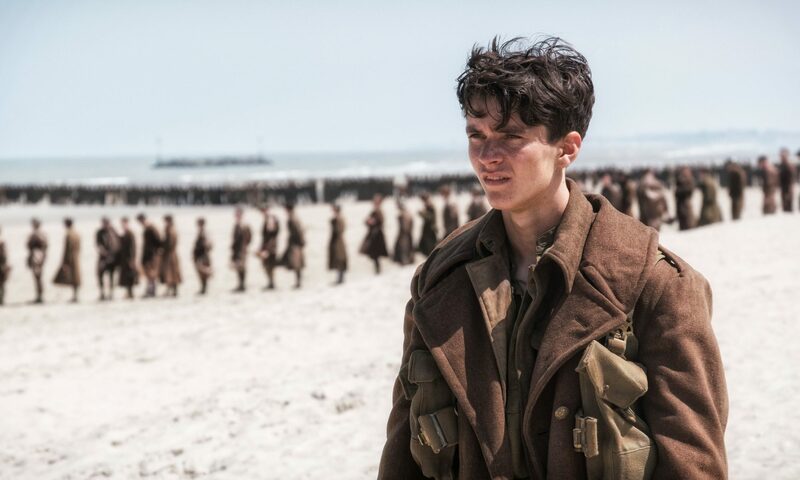 Thus, the heads of the various film departments of production design (Nathan Crowley), costume design (Jeffery Kurland), and even the storyboard department, with Nolan writing the film’s screenplay), must be commended for their achievement in Dunkirk. The movie also sees Nolan reunite with cinematographer Hoyte van Hoytema (who collaborated with Nolan on Interstellar) does impressive work on Dunkirk, providing plenty of cinematic shots for the feature, including its aerial dogfights to the naval warfare sequences. For most of the film, Dunkirk’s visual display is indeed incredible to see, especially those who see the film in theaters on either IMAX or large format screens. Behind the camera, the film’s editor Lee Smith has a daunting task (and pulls it off) by interweaving the three storyline threads together as well as “cutting” several various shots together throughout the film. However, one of the most impressive things about Dunkirk (on its technical filmmaking side) is the sound editing / mixing for the movie/ Dunkirk’s overall tone and mood is energized by the its sharp and rattling sound effects (i.e. gunfire, explosions, etc.). I know really…sound editing / mixing in a film being noteworthy. I was little bit shocked by it too, but it truly does standout in Dunkirk and aides to the overall cinematic movie experience that Nolan wants to convey to its viewers. So, I have to give a big thanks to the whole sound editing / mixing team that worked on Dunkirk. Lastly, legendary composer (and frequent collaborator with Nolan) Hans Zimmer provides the score for the film. Much like sound editing / mixing team, Zimmer’s music helps add to the Dunkirk’s overall tone and feel, with good helping of musical undertones and scores that play up the more tense and nerve-racking scenes. Due to Nolan’s framework of the feature, the movie, which is essentially a nerve-racking race against time that focuses on the here and now situation with its three respective storylines, doesn’t allow that much time for character development. If I had to choose a negative point about the movie, it would be that. On the other hand, however, given the fact that this decision by Nolan was sort of “by design” in the overall direction of the film, then it’s just a minor negative quibble. Although, I do have feeling that some people will be turned off by this decision. So, while the characters aren’t as fully-rounded and wholesome as some will like them to be, the main cast members in Dunkirk are strong across the board and are greatly effective in their respective roles, allowing them to be more “human” (aka real people) in the feature rather than stoic cinematic portrayals of soldiers. Of course, standout performances include Mark Rylance (Bridge of Spies and The BFG) as the civilian mariner Mr. Dawson and frequent collaborator with Nolan Cillian Murphy (Batman Begins and Inception) as the unnamed shell-shocked soldier (dubbed “Shivering Soldier), Jack Lowden (Wolfhall and ’71) as the RAF pilot Collins, and Tom Hardy (The Dark Knight Rises, Warrior, and Lawless), who, much like his role as Bane in The Dark Knight Rises, still can deliver an expressive facial performance, even with most of his face obscured from most of the film, as the RAF pilot Farrier. Additionally, relatively newcomers like Fionn Whitehead (Him) and ex-One Direction member Harry Styles both give compelling and naturalistic performances as the young British soldiers Tommy and Alex. Each one of these characters are kind of sort of like the main characters / players of Dunkirk, with some like Whitehead’s Tommy, and Hardy’s Farrier, getting a satisfying story arc for their characters. Much like the main characters, Dunkirk’s supporting cast members are as clearly defined in the character development, but prove effective in their roles that are assigned and their limited screen-time to make them noteworthy in their performances and memorable in the feature. This ranges from young actors like Tom Glynn-Carney (Casualty and The Last Post) and Barry Keoghan (’71 and Traders) as Mr. Dawson’s son Peter and friend George to Aneurin Barnard (Cilla and Citadel) as the soldier Gibson (who befriends Whitehead’s Tommy), to more seasoned character actors like James D’Arcy (Cloud Atlas and Marvel’s Agent Carter) and Sir Kenneth Branagh (Hamlet and Henry V) who play high-ranking Allied Officers Colonel Winnant and Commander Bolton. Additional, I must commend the nameless cast of thousands of extras that appear in the background of Dunkirk. They might not be important as the characters mentioned above (their just there to fill in the backdrop of scenes), but it’s definitely attribute to them on much they had to endure throughout the film’s production, which is highly commendable. Lastly, it wouldn’t be a Christopher Nolan without having veteran actor Michael Caine (Zulu, The Dark Knight trilogy, and Inception) make an appearance in the film. However, while he doesn’t appear in the flesh in Dunkirk, Caine does provide a “audio” cameo as radio communication to the Royal Air Force. I was actually not going to watch this movie at first but Harry Style’s in it so I guess I have to right? No but it does sound like a movie worth watching, even for a person who’s not the biggest fan of WW2 movies. Haha…..I guess if you’re a fan of Harry Styles, then you got to see Dunkirk. Even if you aren’t a fan of WWII movies, Dunkirk is definitely a cinematic experience, especially to see in theaters. My only counter is that, in terms of character development, I think Nolan was very intentional here. This is about the event, not necessarily the people involved. Normally, characters drive the event (plot), but it’s flipped in Dunkirk. These people are helpless, and that’s really all we need to know. And Nolan even goes as far as to not introduce anyone by name because we don’t need their names– much like we don’t remember the name of any solider in WWII (unless they’re our grandpa/dad). All in all, Dunkirk is a must-see, and I hardly ever say that. Hey there….thanks reading my review and commenting. As I said in my review, it didn’t bother me as much of the character development in Dunkirk since it was “by design” what Nolan did (focusing more on the event rather than its characters). Also, with the film only being 107 minutes rather than his normal 2+ hour film, I kind of figured it. So happy that this was under 2 hours. More films need to follow suit. It was just another war movie for me. The plane scenes were the most memorable. If people go for the actors/acting, they will be disappointed. I’m glad you liked it though, you give good reasons. I don’t see it as much of an achievement but it is a completed thought and some fans will go in with a pro Nolan mindset I’m finding and completely disregard anything to counter it. I don’t think you are one of those.